Most of all I take pride, dedication and give 110% at any Job I do.. 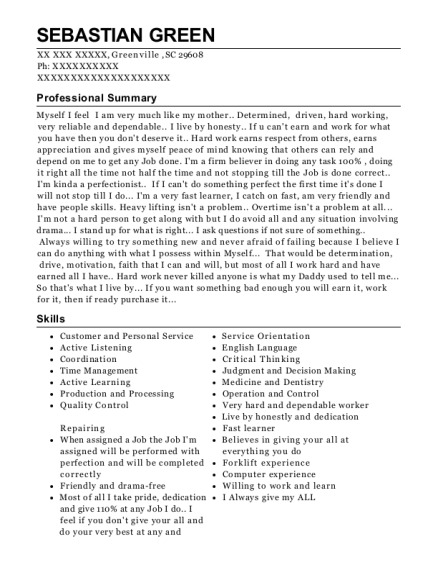 I feel if you don't give your all and do your very best at any and everything in life that you as a person are showing only half of what you possess as a person when u can show all 100% of what you possess..
prodution May 2013－Mar 2015 House of Raeford － Greenville , SC Job duties were to run, keep up and maintain a fast moving assembly / production line... The production line of the position I was assigned to consists of making sure poultry (whole chickens) were cut open correctly.. If certain machines were knocked off timing I had to cut the birds to perfection until machine was fixed. During that time I would cut at a very fast pave to make sure the birds were cut to perfection to guarantee that the birds would go into the next machine without any problems... If birds were missed while moving on the line I would examine the bird, cut the bird and rehang the bird on the line to be inspected by USDA ..
CNA / Medtech May 2005－Oct 2007 Rosecrest － Inman , SC Assigned to Alzheimer's and Dementia Unit.. When time to administrator medications morning,noon and evening I would pull each patients chart look up and pull the medication for that patient and give the medication to the patient sign off on the doses, medications and time the medications were giving..After that one patient was completed in the medication book I would pull the next patient and etc. Till the entire medication book was pulled, administratored to residents and signed off on..
At the end of shift I would order supplies for the residents as needed... Check the medication cart and place orders to the Dr's of the residents when certain medication calls for refills... Call the families of the residents letting them know how their loved ones are doing that day.. Before the residents get ready for bed my Job was to exercise the arms and legs called range of motion so when the morning came the residents wouldn't be so stiff and sore when the woke.. That would make sure their day would start off great if they woke with no stiffness and aches.. The goal if my Job was to care for the residents as they were my own father or mother which I took great pride in and alot of love and care!!!! puller/packer... shipping/receiving Apr 2001－Jun 2004 BSG Beauty Systems Group － Spartanburg , SC Job duties were to pull orders that were sent directly to the area you were assigned. Pull the complete order, check off that it was pulled, then sign off on it and push it off to it's next destination for the order to get filled and completed. Myself was offered another position at this company to shipping/receiving..
Job duties were to load and unload trucks with a cherry picker forklift. Place the shipment in the correct location for it to get tagged and logged into the system so it can get placed into the right location due to the type of product.. Prepared circuit boards and mother boards to be inserted into cable,modem and satellite boxes and receivers..
Room Attendant Mar 1996－Nov 1999 Jackpot's Casino － Spartanburg , SC Job duties were to pay out the winning to the player's at the Casino. The employee's were responsible for large amounts of money ranging from $5,000 to $7,000 each shift.. When a player would cash out the attendant would take their ticket in exchange for their winnings... At the end of shift my responsibility was to add up the balance of the cash out tickets turn them in and receive the cash back to make my drawer balance out evenly to what is was at the beginning of the shift. 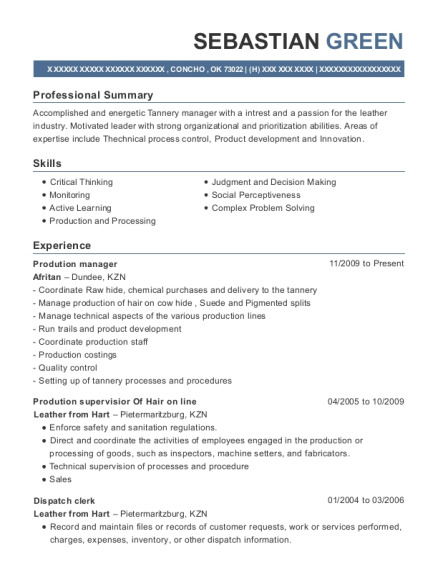 This is a resume for a prodution in Greenville, South Carolina with experience working for such companies as House of Raeford and Rosecrest. 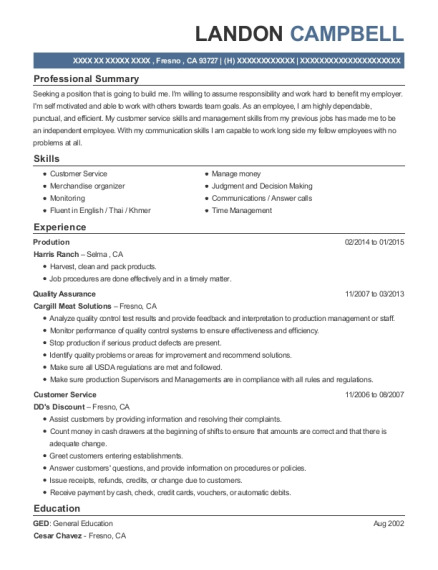 The grade for this resume is 0 and is one of hundreds of prodution resumes available on our site for free. 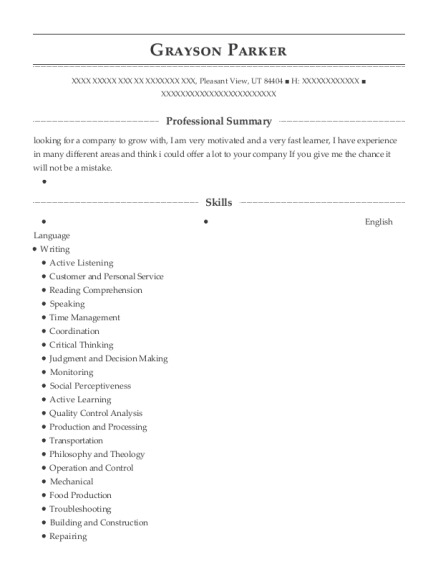 Use these resumes as templates to get help creating the best prodution resume.